Halfway between mainland Korea and Jeju Island is a group of 42 small islets that has been a part of Korea for at least 800 years. The islands rise abruptly out of the sea and have a beautiful harshness. Generals have been stranded and exiles banished there. Chujado, with its two main islets of Hachujado and Sangchujado, is a place where fishing rules and everyone’s life seems to slow down. Olle founder Suh Myeong Suk has previously said that the walking trails’ massive popularity is due to a hunger by city residents to slow down and enjoy a slower life. The weather has been fickle lately so, unable to visit Chujado with a translator on a weekend day, I made the journey alone on a weekday to experience the slow life by myself. Most Olle trails around Jeju follow the reasonably flat coastline, sometimes climbing the occasional volcanic cone, or oreum. The Chujado Olle trail, No. 18-1, which opened on June 26 is a strenuous 17.7 kilometers of ups and downs over the two main islands, weaving through hillside towns, around the island’s seaside cliffs, back up the hills and finally down to pebble beaches. There are only two ferries a day to Chujado and the times are so close to each other that you would be rushing to walk the trail without an overnight stay. The day I went to Chujado the rain held off but the fog was thick. When I landed, I was extremely disoriented. I was the sole Olle walker on the boat and nobody knew exactly where the trail started. It didn’t take long though before I found the distinctive blue arrows that mark Olle trails and I was on my way through the harbor village. The roads between the houses are more like alleys - so narrow that you nearly bump elbows with people as you walk by. The villages on Chujado are small and it’s not long before I was out of the village and into the countryside. The trail climbs up the far-east side of Hachujado, past a beautiful pebble beach and to the top of the sea-cliffs over-looking the ocean. The far eastern coast of the island rises to a cliff, high above the sea. The grave of the exiled Hwang Kyeong Hun overlooks the ocean. In the early 1800s, Catholics were brutally persecuted in Korea. Hwang’s father was executed and his mother was exiled in Jeju while he was left in Chujado along the way. Kyeong Hun was found and raised by a fisherman with the family name of Oh and, to this day, nobody from the Oh family can marry a member of the Hwang family. This is a very small community. 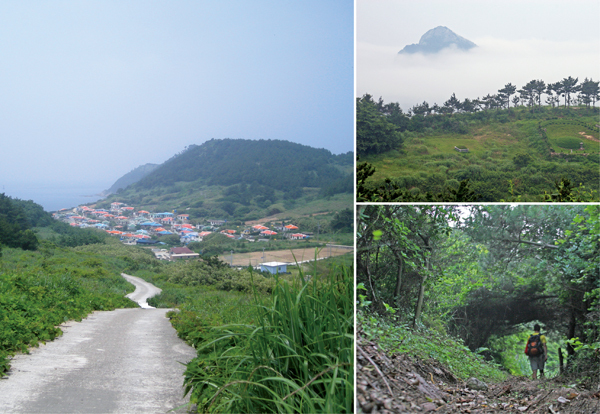 As you head north, you follow a new trail created specifically for Jeju Olle. It winds through the forest and over the sea cliffs, with only a rope between walkers and a long drop to the sea. At the highest point of the Olle, Daedansan, all of my worries about the fog went away as it cleared for the first time and I could finally see all of Chujado. It was a glorious view as I stood above the mist. The low fog still covered most of the sea but numerous islands were visible poking through. All my troubles were forgotten as I basked in the beauty of the moment. As dinner time came, I was still on the lower island of Hachujado. The locals at every village informed me that there are no restaurants or hotels except in the main city on Sangchujado. Fortunately there’s a bus on a 30-minute rotation and I made my way to town to enjoy Chujado’s specialty of gulbi, or yellow corvina. I woke up in the morning and decided to walk around Sang-chujado and retrace my missed steps if time allowed at the end of the day. There was still no rain, but the fog was so dense that the trees were dripping. The path leaves the town and behind the school you learn the story of General Choi Yeong who was stranded here in the 1300s. While on Chujado, Choi taught the locals how to make bigger and better fishing nets to catch more fish. Residents still honor him annually with a ceremony at his shrine. Maybe being marooned for a few days wouldn’t be so bad after all. Finally, after two days of dense fog and just as I was at the end of the trail, the rain finally came down. I had memories of my friend’s sister who was stranded on Chujado for five days due to rain and high seas and wondered whether I would be stranded also. I heard the surprising sound of music as I came closer to the summit of the last hill. I could hear it from quite a distance away and could only see a silhouette at the summit. It was a beautiful sound, and I waited a minute before approaching the musician. He welcomed me into a shelter to get out of the rain and said he was a native of Jeju who worked for the police, and was assigned to Chujado for a few days. The instrument he was playing was a long bam-boo flute, known as a taegum. The sound carried me away and life once again slowed down. The music stayed with me until I saw the ferry come into the harbor to take me away.